Simon & Schuster/Paula Wiseman Books, 9781481476843, 48pp. Venus and Serena Williams. Two peas in a pod. Best friends. Sisters. With vibrant mixed media art, nonfiction superstars Lesa Cline-Ransome and Coretta Scott King Honor winner James E. Ransome share the inspirational story of two tennis legends who were fierce competitors on the courts, but close sisters above all. The lively narrative . . . focuses on [Venus and Serena Williams's] determination to succeed and their close relationship. Ransome uses cut paper, pencil, and acrylic paints for pictures that are varied and energetic. The story of record-breaking tennis greats Venus and Serena Williams has some- thing for everyone: they’re sports superstars, civil rights champions, and fiercely loyal and hypercompetitive sisters. . . . [T]his account celebrates their amazing, uplifting career journey and hard-won success. The acclaimed Ransome husband–and–wife duo move from the historical to the present-day with this story of African American sisters Venus and Serena Williams, who changed the game of tennis with their prowess and determination. . . . Clear writing, aninviting layout, collage-style pictures, and quotes from the sisters and their parents make this nonfiction format accessible for emerging and more confident readers. Cut paper, pencil, and acrylic paints blend seamlessly to create beautiful bold, colorful illustrations in tribute to two amazing athletes. . . . Will appeal to children and sports fans of all ages. This lovingly crafted picture book biography centers on the incredible bond between Venus and Serena Williams and one of their signature accomplishments: being the first two sisters in tennis history to rank numbers one and two in the world. . . . Fans of tennis will be in for a treat as Cline-Ransome recounts the Williams’s matches with thrilling detail. . . . An important selection for biography and sports collections. Wife-and-husband team Cline-Ransome and Ransome celebrate tennis superstars Venus and Serena Williams, focusing on their formative childhoods and the way their preparation and talent fundamentally changed the game. Cline-Ransome’s chronological account begins with the sisters’ pre-dawn practices in Compton, California, sweeping the public courts of garbage and broken glass before applying themselves with phenomenal dedication (“By the time Venus was four she could hit five hundred tennis balls at every practice”; “When gunshots rang out in the distance, [their father] Richard reminded them, ‘Never mind the noise. Just play’”). As they grow and improve, moving from their family’s private coaching to the professional tour, they become the dominant force in women’s tennis and find themselves playing against each other with increasing frequency. Ransome’s detailed collages reflect this shift. Early illustrations show the girls close together, dressed in like colors with similar hairstyles. As the story progresses, the sisters are positioned apart, wearing different colors, until as young women they find themselves on opposite sides of the net, their separation emphasized by the book’s low, wide trim size. The final spread, showing them on the same side of the net, holding hands, after Serena bested Venus in the 2002 French Open, communicates the sisters’ ultimate devotion to each other. Thorough back matter—including an afterword, source notes, a selected bibliography, and further reading—is appended. Husband-and-wife team James E. and Lesa Cline-Ransome (Before She Was Harriet) offer a powerful portrayal of the sisters and tennis legends. Growing up in Los Angeles, Venus and Serena played tennis in the courts of East Compton Park, where neighborhood gunshots sometimes interrupted their practice. The book follows their move onto professional courts, where they drew attention for their raw talent and expressive styles, as well as their unfortunate treatment by some watchers, who “threatened, booed, and taunted” the sisters for their skin tone. Cline-Ransome conveys the sisters’ affection and competitiveness, emphasizing how Serena remained one step behind Venus until the 2002 French Open, when “a victorious Serena stepped out of the shadow of her sister.” Yet the sisters are pictured standing side-by-side for Serena’s win: “ ‘Nothing can keep me from celebrating when my best friend wins a match,’ Venus said proudly.” Ransome’s sophisticated portraiture captures a likeness of the two athletes, while spreads feature playfully stylized cut-paper collage accents—visuals that enhance this tribute to sisterhood, athletics, and determination. 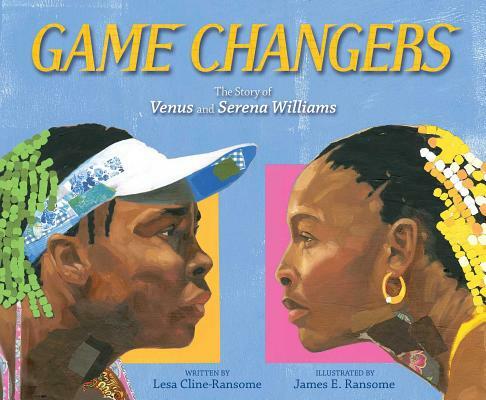 Award-winning author/illustrator team Lesa Cline-Ransome and James E. Ransome's newest nonfiction picture book pays tribute to two of the world's most impressive athletes: tennis stars and sisters Venus and Serena Williams. . . . The illustrations glory in the sisters' brown skin and colorful clothing, making them prominent "in a sea of white tennis attire, white fans, and white opponents." Every page is splashed with vibrant color and eye-catching patterns, and the figures of the women themselves are full of energy, speed and tension. An afterword, selected bibliography and source notes round out this incredible tennis life story of "two of the most popular athletes in history."